You are perhaps aware that more and more classrooms are opening their doors to student discussion online. This happens in the virtual online classroom, but also in the blended classroom. As you might know, the blended classroom is one where students and teacher meet in a traditional school but use the internet to open the classroom walls to the community, region, country, and world. There are many services that provide student discussion forums that can facilitate student online interaction. Some well known ones include, Edmodo, My Big Campus, and Moodle. A discussion forum does not have to be question and answer. In fact, there are countless ways to use them. I want to share with you ten that I came up with. Please share with me others you might have, and I will add for a future list. One point to remember is to be sure to keep your point of emphasis aimed at the content standards, 21st century skills, while moving up Blooms higher levels. Here are some ways I have found that you can bring your discussion forums up to a new level. Please enjoy and let me know what you think and ways you have found that a discussion forum can be a engaging tool! 1. A formative tool - As a way to check understanding from class that day. This might be a temperature check and drive teacher facilitation and instruction the next day. Some times students will see others not understanding and give their own explanation. Many times we can all learn from the crowd. 2. A divergent tool - Students do not reply with answers… but new questions. The rule states that no one is allowed to answer a question… just pose new questions. What might the class do with this the next day? 3. A reflection tool -Students reply not giving a statement of content or material… but a reflective thought to show application & connection. Allowing for important meta-cognition can be powerful while engaging learning. Take a step up on Blooms! 4. A launch and inquiry tool - No explanation or instruction… students are posed with a question or video that will cause thinking/questions that will be used the next day. Perhaps students just need to come with thoughts, questions, and ideas that they first express online and will relate to higher learning activities in class. 5. A connection tool – Students watch a video or do a reading that emphasizes what happened in class and they then make connections in their reply. It is important that the students be required to show the connection. A video might be used that demonstrates the math they learned in real life. How might students show that connection? 6. A mentor tool – An online expert could be a guest forum host to answer questions for student on a topic. This is a perfect opportunity to open the classroom up to real world connections and possibilities. Any mentors should be interviewed and approved by teacher and front office while following school guidelines. 7. A simulation tool – Thoughts and ideas could be posted on line by a famous person or character in a book. Students would reply showing content knowledge and application. Teachers will get insight on student understanding of important concepts. 8. A role play tool – Students are given characters in a book or history and interact in a discussion using their character role. Imagine the conversations that will happen and how a teacher can assess understanding at the same time. 9. A research tool – Students are asked to find one or two research links to share with each other. They give reasoning for the link they selected. A collection of student links or a Google Custom Search Engine for the class is built for everyone to use. 10. Student centered tool – Why not put students in charge of a forum? It might fit into their PBL project or promote content in the classroom. Having students in charge can give ownership and stress the importance of an academic forum and the scholarly ways they should be used. 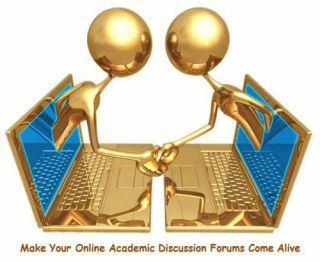 Next Post: 10 Ideas To Facilitate The Culture Of Scholarly Academic Discussion Forums…. Please join me!